Right after 9/11, a Special Forces unit is send to Afghanistan to bring down the Taliban. 12 Strong is directed by Nicolai Fuglsig and was released on Jan 19th, 2018. 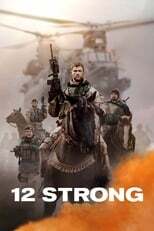 Director Nicolai Fuglsig's War & Drama movie 12 Strong is produced by Torridon Films & Alcon Entertainment & was released 2018-01-16.